We provide useful insights, tips and tricks, presented in an easy way to understand – all in the name of helping you level-up your SEO and online marketing skills. 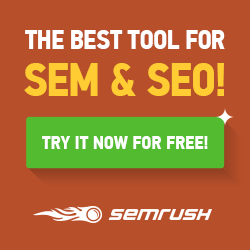 With its complete suite of Search Engine Optimization (SEO) tools, SEMrush dissects your competitors’ Google Analytics accounts to give you a behind-the-scenes view of their campaign(s). Inbound links are one of Google’s three most important ranking signals – the other two being content and RankBrain. This underscores how critical links are to your ranking on SERPs, or search engine results pages. SEO vs PPC: Which Is Better? Whether to choose search engine optimization over paid search advertising is a question of balancing the pros and cons. Do you want a constant stream of visitors to your website long after you stop running a campaign or are you looking for a quick brand rollout? People are increasingly turning to voice search to look for information on the internet. Apparently, most people find it easier to talk than text. Searching by voice is convenient, quick, and you can do it on the go. At the end of November 2017, Facebook announced their new features to help charities and non-profit organizations, that can also be used for non-charity purposes. Sign Up And Receive Our Exclusive Digital Marketing Tips Right In Your Inbox!